We went to the information table to pick up our schedule for the day, and that’s when we got the news. Due to a lack of response from their normal presenters, the event was especially understaffed this year. Because of this, we were going to have twice as many kids as we had prepared for and a shorter time to interact with them. We weren't sure that we could handle those numbers, but at that point, the buses were starting to roll in and we just had to go with it. To my surprise the presentations went almost as smoothly as they had with half as many kids and the whole day went great. We reached approximately 300 students that day in 4 hours. There are numerous stories to share this month, but one of my favorites came from visiting one of the local elementary schools. 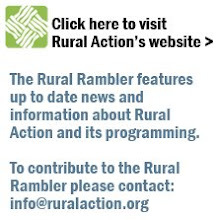 The program I offered included a discussion about coal, it’s formation, extraction practices, uses, related issues, alternative energy sources, energy conservation, and the 3 R’s. 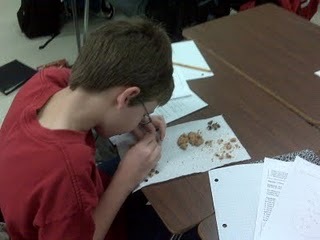 We also “mined” for coal during a simulation that involved chocolate chip cookies, toothpicks, and paper clips. The children mined the chocolate chips out of their cookie, and then reclaimed the land by trying to put the crumbs back together. We ended the program with a relay race where the goal is to earn as many points as possible by reusing many common items that are usually thrown away, by composting food and yard waste, and by properly recycling. Many children had no idea how electricity is made, were horrified to learn the issues relating to the old mining practices and the burning of coal, and were excited to learn ways they could make a difference. I feel it is very important to educate youth about the issues our regions faces and to empower them with ideas of how they can really make a difference. At the end of the day I got a lot of hugs, and am hopeful that these lessons will stick with the future leaders of our region.